a German computer scientist, games researcher, and professor of Computer Science at the Zuse Institute Berlin (ZIB). He studied physics at the Technical University of Braunschweig and computer science at the University of Hamburg and during two one-year visits in Edmonton, at the University of Alberta. In 1982, he concluded his graduate in computer science and in 1987 he received his Ph.D at the University of Hamburg. From 1983 to 1987, he worked as a scientific employee, and from 1989 to 1992 as assistant at the University of Hamburg. During the years 1987 to 1990 he collected industrial experience as a management consultant in the areas of Systems analysis, Databases and Compiler building. In 1992 Reinefeld collaborated with the Paderborn Center for Parallel Computing (PC²) at the Paderborn University . Since 1998, Alexander Reinefeld leads the area of Computer Science in the Zuse Institute Berlin (ZIB). 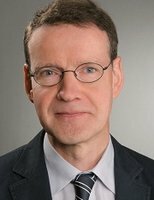 He is a member of the Gesellschaft für Informatik, the ACM, the IEEE Computer Society, the German university association Deutscher Hochschulverband (DHV) and Chair of Parallel and Distributed Systems at the Humboldt University of Berlin. In 1979 at the University of Hamburg, motivated and supported by his advisor Frieder Schwenkel, Alexander Reinefeld designed the chess program Murks, partly implemented in microcode for an Interdata M85 minicomputer. Reinefeld: world chess champion Mikhail Botvinnik visited us and played against Murks. In 1980/81, a team of four students, Manfred Allers, Dirk Hauschildt, Dieter Steinwender and Alexander Reinefeld, ported Murks to a Motorola MC68000 Microprocessor, then dubbed MicroMurks. They built their own MC68000 microcomputer from scratch  Micromurks II represented by Dieter Steinwender, participated at the WMCCC 1983 in Budapest. In 1983 Alexander Reinefeld introduced the NegaScout search-algorithm, an improvement of Judea Pearl's Scout  . Ten years later, in 1993 at the 7th Advances in Computer Chess conference, Reinefeld made an attempt to resuscitate Stockman's SSS* algorithm, and proposed an improvement of the recursive RecSSS*  , initially developed by Subir Bhattacharya and Amitava Bagchi  . Despite promising results with some trees of depth 8, the space (memory) requirements were still very (too) high, and with the research of Aske Plaat, Wim Pijls and Arie de Bruin concerning Alpha-Beta with zero windows and transposition table in SSS* and Dual* as MT, SSS* was finally declared "dead" by Pijls and De Bruin in 1996  . Alexander Reinefeld (1989). Spielbaum Suchverfahren. Informatik-Fachberichte Volume 200. Springer-Verlag, Berlin, Germany. ISBN 3-540-50742-6. Florian Schintke, Jens Simon, Alexander Reinefeld (2001). A Cache Simulator for Shared Memory Systems. International Conference on Computational Science ICCS 2001, San Francisco, CA, Springer LNCS 2074, vol. 2, pp. 569-578. This page was last edited on 1 June 2018, at 13:01.